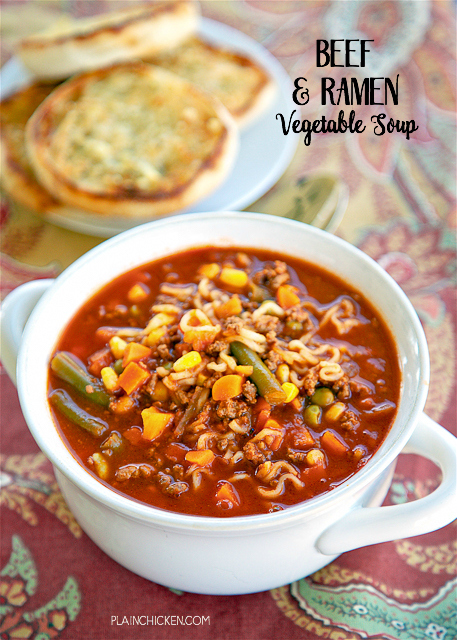 Beef and Ramen Vegetable Soup - only 5 ingredients and ready in under 20 minutes! Ground beef, V-8 Vegetable Juice, Onion Soup Mix, Beef Ramen Noodles and Mixed Vegetables. SOOO good! Everyone loved this soup and went back for seconds. Great for a crowd! Soup season is my favorite!! We have soup at least once a week during the cooler months. 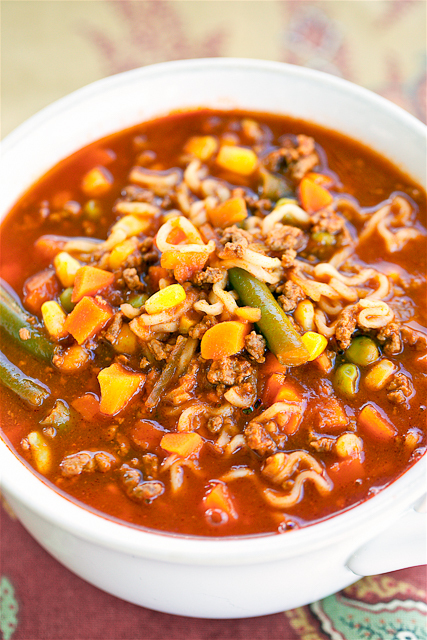 This Beef & Ramen Vegetable Soup got two thumbs up from us. It was so good and we LOVED the ramen noodles!! There are only 5 ingredients in this soup and it only takes about 15 minutes from start to finish. You seriously can't beat that!!! Cook the hamburger, add the soup mix, vegetables and V-8 juice. Let it simmer for a few minutes, add the ramen and let it cook for 2 or 3 minutes and you are done! This was so easy to make that I let Chicken Legs make it! He did a great job!!! The best part is that this is one of my favorite vegetable beef soups. We will be making this a lot during soup season. In a Dutch oven, cook ground beef over medium heat until no longer pink. Drain. Stir in V-8 juice, onion soup mix, seasoning packet from ramen noodles and frozen vegetables. Bring to a boil. Reduce heat to low. Simmer uncovered for 10 minutes. Return to a boil and add ramen noodles. Cook for 3 minutes. I was so excited to see this!! Many moons ago (the 90's? ), back when I got all of my recipes from different email groups I was in (remember the day?? ), I made this soup quite frequently. I'm sure I still have it somewhere, hidden in a recipe file the old-fashioned way. Now that I am a pretty strictly Pinterest recipe finder, sorter, maker, and saver, I am SUPER EXCITED to PIN this to my Keeper Recipe board. Oh, and it's cooking on the stove as we speak. So easy!